SAP Forecasting and Replenishment is SAP’s proven solution to maximize product availability and minimize inventory level – both for stores and distribution center. A tool that works every day to achieve exactly that balance – and more. F&R customers report significant benefits reaching from reduced inventory positions, increased margins and cash flow. At the same time accurate forecast ensures that their product offering is matching customer demand and revenues are getting bigger. Designed to handle high data volumes of retail companies it is a self-learning system that frees up people from manual activities and allows to focus on other value drivers such as customer service or vendor negotiations. 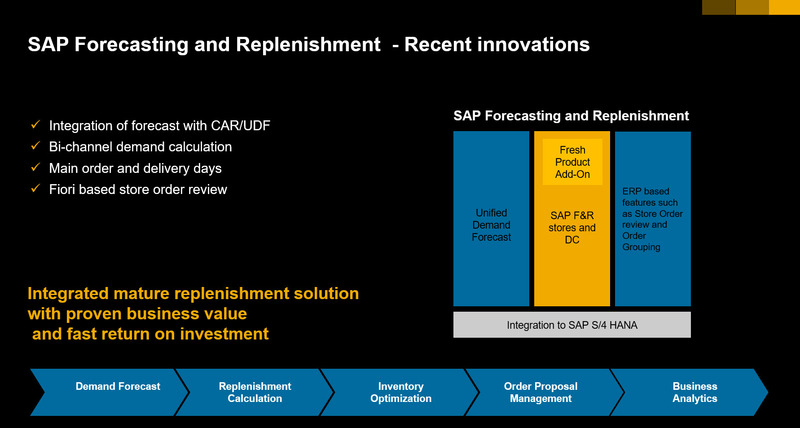 Consequently, it is now also possible to use within SAP F&R’s replenishment processes UDF as forecasting input. You can choose for which products you want to use UDF in F&R – simply checkmark it in the forecasting profile. So, you can start with selected categories if you want – leveraging the newest forecasting technology w/o disrupting your existing F&R replenishment process. For more details please refer to note 2367172 , it contains a detailed integration guide. If you use Multi Echelon Replenishment the principle is always the same: The demand of the supplying location is driven by the demand of the next lower level. The start is the lowest possible level: Store Sales Forecast represents the customer demand in the stores including all known factors such as seasonality, holidays, events, price changes DIFs and promotions. Based on this and other parameters such as current and future inventory position a store order forecast can be calculated inventory position, order and deliver schedules and logistical units in the ordering process –what are the stores likely to order and from whom. These order forecast can be aggregated for the next level, e.g. a DC and used instead of a separate forecast. By doing this, all relevant information is factored in and a truly demand driven replenishment can take place at all levels. What is now new in this scenario? Let’s imagine that not all your stores are running in F&R, for example some of them are franchisees and you do not have their data. Therefore, this demand cannot be part of the aggregates store order forecast and you need a separate forecast. Another use case could be as separate wholesale channel where you would like to have a separate forecast based on goods issues. This is now possible with an enhancement for a bi-channel demand calculation for a supplying location: One channel is fed by MER as before, e.g. your stores. The other channel can be forecasted on the relevant historical time series of the supplying location, for example the wholesale relevant goods issues of the DC. The two demands can be added up to an overall DC demand. Details how to use this can you find in note 2506050 . Another important area in replenishment is requirements calculation. It is based on order and delivery schedules in F&R. They define when to order and for how many days. These so-called demand periods have a significant impact on the total quantity that is ordered the longer they are, the more is ordered and of course it is ordered less frequent. In most cases there are defined rules for assortments: some are ordered daily, others maybe weekly. Logistical reasons are sometimes driving ordering or delivery days this – towards the weekend there is usually more customer demand, but not all products should arrive in the store shortly before the weekend so that store staff would have difficulties to refill the shelves. Also on DC level it might be desired to level a bit the outgoing merchandise during the week. But how can I ensure that unexpected situations will not cause out-of-Stock especially shortly before weekends? But also, not order every day in small chunks? High safety stocks can result in waste and overstocks, automatic distribution such as the existing order balancing feature is also often not the desired solution. This can be addressed now with a new order/delivery type is introduced: Main and supplementary days: In the regular case, demand periods are from a main day to the next main day. In between there can be one or more supplementary days. In case unexpected demand occurs, the system will consider these supplementary days as additional order (or delivery) days and thus create additional orders. For example, if a regular order took place on Monday and will arrive on Friday but is not sufficient for the weekend, the system might reorder on Thursday again a minor demand. In addition to the new definition of main and supplementary days, it is also possible to define min and max coverage periods that can be used to fine-tune the resulting quantities. Even though there is a lot of automation possible in F&R, sometimes the stores need to have a look at some products and their suggested order quantities, especially the critical ones. Ideally, they should even be able to combine this along with other tasks, such as stock corrections and product look- up and manual assortments. How could they do this best? Part of the SAP offering for store processes are Fiori based in-store merchandising apps based on ECC or S/4 Merchandising. Nice looking screens that can intuitively be used by store employees, even on their mobile phone. There is already a wide array of existing apps such as Lookup Product, Count Product, Receive Product and many more. Starting from a tile-based launchpad the store associate can go to the order products app to view and adjust if needed quantities coming from F&R order proposal items on a list display. To focus on the most important ones, exception information can be used to filter the list, for example restrict the list to the ones that must be reviewed. In case the store employee cannot decide based on the displayed information if the quantity can be accepted, he or she can go one level deeper and branch to a detail view where they can see on a calendar basis sale of the recent past and scheduling information along with the current range of coverage in days for this order quantity. If the quantity is manually changed, the range of coverage will be recalculated and gives an idea for how long this quantity will last – an easy doublecheck if this really makes sense. Please consult also note 238363 for further process information. There are a couple of interesting new developments for SAP Forecasting and Replenishment. We just covered the highlights but there are even more. For most of them there are detailed notes available. How can you easily find out if something new was released? There is one very important note you always keep in mind – 2335048 ! It is regularly updated by our development and contains an overview about all the other new notes and topics. I hope you enjoyed this brief update! Very interesting reading. Fiori integration is good news!